Not you too Stana! Just when you think you might 'just' be a crossdresser, it turns out 'two years' have gone by. I think many share your feelings and fears. You know more about living an authentic life than most people. Thank you for this frank (and yes, depressing in some ways) post. If it means so much for you to live as a woman, do so. If your family rejects you it will be their decision. I think it would be better to live in one mode instead of alternating between "homme" and "femme" nodes. Whatever you do, don't run away from your family. I as a man wear skirts publicly, and I don't feel as if I have to get permission to do so. Sometimes I even wear a dress. My family still accepts me. Do not feel bad. Life is full of both good and bad. One of your better traits is the way you make the most of everything that life has thrown your way. Enjoy all that you are. Golden handcuffs are a blessing and a curse. Find joy and fulfillment in all that you do. ARe you afraid they will say no or that they will say yes? The moment we put some truth into symbols -- the symbols of words, the symbols of dress, whatever -- we make it in some way false. We may crystallize the moment, but in doing so, we cut it off from other moments, from the circle of lives that will always be contradictory and ambiguous. The purity of life is not in assertions, not in answers, but in stories full of questions, where many threads come together, each leading away in another direction. The question isn't authenticity; it's journey. You have been father and husband, and that was a triumph, not only a triumph as a person being the man of the family, but also a triumph over your own nature. But like any tidal story, what we turn away from calls us back. And now you see the possibility that those dreams you had to shitcan as a young person are possible. Maybe you can not only be useful, valued and potent, but you can also feel truer to your own nature. You have the gift of possibility. You have given much of yourself over the years to your family, more than they can imagine unless they know what you had to deny to be who they wanted you to be, who they needed you to be. You feel the need to leap. You know this leap will be terrifying, both for them and for yourself. Can you be more than a crossdresser, moving to expand your claim to woman into a wider world, taking on not only explorations but also responsibilities as a woman? 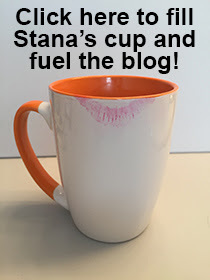 It's not an easy journey away from the sweet world you have created, where Stana lives in a blog that others find aspirational, a lovely cross-dressed life. But in the end, the journey is the journey, and we have to follow not only the expectations & demands of others but also the call of our own heart. You feel the pressure, the need to leap. You feel not only the need to be pretty, but also the need to jump forward. Almost time to leap, Stana. But don't imagine leaping away from your life, just because you don't want to distress others. Imagine leaping into your life, and helping others claim their own authentic hearts with your bold -- and beautiful -- example. I think you know, Stana, that the inner drive to transition is and has always been in my thoughts constantly. I deal with it by diverting my attention (work and my hobby), exercise, friends and diet. You have dealt with it superbly over the years using various methods, some of which we both have in common. Nothing is more important to me than my family and THAT is the only reason I continue on as I am. Yes, an unusual post from you. I do hope you cheer up. I depend on your blog and adventures to keep me going! I love you. I love your Blog. I admire your truthfulness with yourself. Life just is. The Isness is what makes it life. To experience it in any fashion brings our own truth. I find it dificult at times to live for someone else and not for just me.I am 75 this year and I have learned to love my self as I am.My honesty with myself allows me joy. Joy in knowing we are all united in one life whether it be on this plane or another. Each experience brings me wisdom that belongs only to me and is a great treasure.I am . I salute your dedication to your own truth. As i'm a guy I wear pantyhose to work an play even to the malls an shopping as I wear genie slim tone leggings ever day with lon shirts I do it because. I like the fill of then I even were my mom's punk Clos alot even around the house.